From February 22 to February 25 the 2017 Conservative Political Action Conference (CPAC) took place in Washington, D.C. CPAC is one of the most important conservative conferences of the year, and many of the speakers at CPAC this year were allies of the new Trump administration. The most high-profile person who spoke at CPAC 2017 was President Donald Trump. 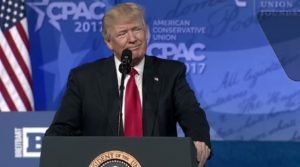 Trump was the first sitting president to attend CPAC since Ronald Reagan. Trump’s speech was a victory lap and a celebration of his historic win. He began his speech off by attacking the liberal media for their unfair reporting on him, the election, and conservatives. He then went on to outline his policy objectives he wants to accomplish, such as building the border wall, putting America first in foreign policy, and making “America Great Again”. Many members of Trump’s administration spoke at CPAC 2017. Some of them were, Besty DeVos, Kellyanne Conway, Reince Priebus, and Steve Bannon. In their respective speeches, they reinforced Trump’s policy goals, attacked the liberal news media for its unfair reporting, and talked about getting America running well again. One speech that stood out was Education Secretary Besty DeVos’s speech in which she attacked Obama for the failing schools in America and sang the praise of school choice and voucher programs, which the new administration is more supportive of. Another notable person who spoke at CPAC 2017 was Ted Cruz. In his speech, Cruz talked about a bill he co-sponsored that would put term limits on members of both the House and the Senate. He said, “President [Donald] Trump campaigned on draining the swamp,” and by passing term limits we can drain the swamp. He also spoke of his confidence that Trump’s Supreme Court pick, Neil Gorsuch, would be a great conservative justice. In addition, he talked about cutting the size of the Federal Government and repealing Obama Care. Milwaukee County Sheriff David Clarke was also a speaker at CPAC 2017. In his speech, he sang the praise of Donald Trump and applauded his support for law enforcement. Clarke said, “The rule of law doesn’t divide us. It binds us together in our great American life.” In addition, in his speech, Clark said that when Obama was president he was not proud of America, but now that Trump is President, he has pride and hope again in America. There were many great speakers and moments at CPAC 2017. The conservative movement has a new energy and drive from its recent victories in the 2016 election. CPAC 2017 reflected this tone as speakers told about the bright future for America. They also reminded conference-goers that while the conservative movement has won a small victory, they must continue fighting every day for a smaller government.